In A Second Chance, Jenny suffered a sudden cardiac arrest and is grappling with a flurry of thoughts and emotions about it. Her friend, Carla, is trying to help her figure out type of work she wants to do. This week our prompt is ‘glass’. “As you should be! And I, for one, am very glad that my friend is still here…living and breathing!” With that she bit into her cupcake, getting almost half the dessert in one bite. I turned back towards the pond and watched a turtle’s tiny head cutting through the surface towards the bank as I gathered my thoughts before continuing. 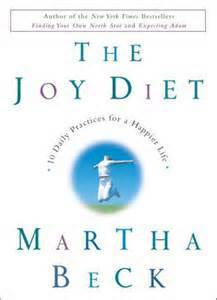 “My awareness has certainly fluctuated throughout the year. There’s been times where I was acutely aware of this second chance I’ve been given and I’ve been abundantly thankful for every breath. And yet…there’s been other days where I’ve noticed that I’ve slipped into oblivion, caught up in old habits and just going through life, task by task, errand by errand – living life payday to payday.” I took the last bite of my cupcake and stuffed the paper liner in the trash bag that sat on the bench between us. “That solves the problem for you. But I do. And here I am, 365 days later, and I’m also frustrated because I don’t feel that I’ve done enough with my extra time.” A hawk soaring over the park caught my attention and I pointed towards it. We both sat watching it as it circled, seemingly lazy in its drifting, yet knowing that it watched the ground beneath it intently, ready to dive in an instant. After it drifted out of view, I continued with my rambling. “I read a quote last week that really made me think. It was by Milton…no, Mill…wait, I think I have it with me…” I stuck my fingers in my jeans pocket and pulled out a folded, and now slightly worn and worse for the wear, slip of paper. “Not really. What have I done any differently? Other than I stopped playing all those farm games on Facebook and started playing with real plants in my garden instead.” I stood and started pacing to counteract the restless feeling that threatened to consume me. “It is. I admit it. But it’s still not enough.” I stopped at the huge oak tree towering over the park bench and placed a palm on the surface of its thick, rough bark. I stood mutely for a moment, trying to connect with the silent sentential, guardian of the park who had seen this area change over the past hundred years. Carla remained quiet, letting me gather my thoughts, which was very odd in itself, as she was usually one who chattered like a magpie the whole time we were together. “No, I haven’t,” I admitted. 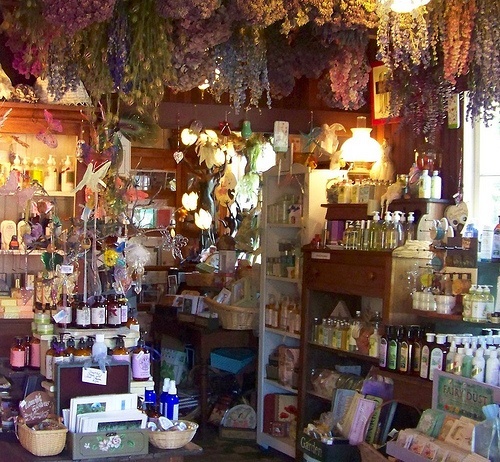 Pictures floated through my mind – images of a quaint little shop, filled with potpourris and sachets, teas and bundles of cinnamon sticks, jars of dried herbs and spices, books, live plants, birdhouses. It was like a slideshow flashing by filled with delightful scenes. I could almost smell the inside, fragrant with the aromas and scents of the goodies that stocked it from floor to ceiling. “Earth to Jenny. Earth to Jenny.” My friend’s voice jerked me back to the present and I realized I’d been staring out across the pond, not seeing a single thing around me except for the vision of my new business. 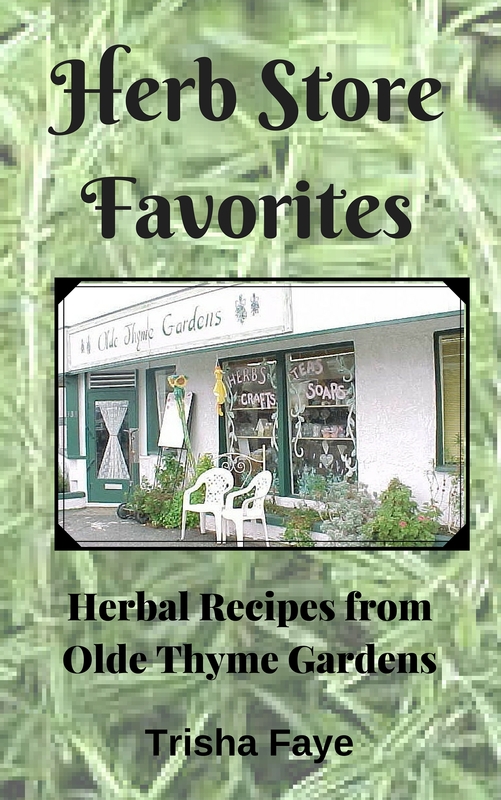 Herb Stores Favorites: Herbs, herbs, herbs…Olde Thyme Gardens revolved around herbs – growing them, cooking with them and crafting with them. In Herb Store Favorites, we bring you the favorites that we collected. Cheese Dilly Bread, Cranberry Orange Honey Nut Muffins, Green Rice, Lavender Shortbread, Rosemary Cookies and Lemon Verbena Buttermilk Pound Cake – along with a host of others. The years the store was open as a brick and mortar, along with three annual Herb Fest’s in California gave us a nice collection of herbal recipes. Some we used in the store at various Open Houses and events. We got others from some of the food contests held in the store, and at the herb festivals. 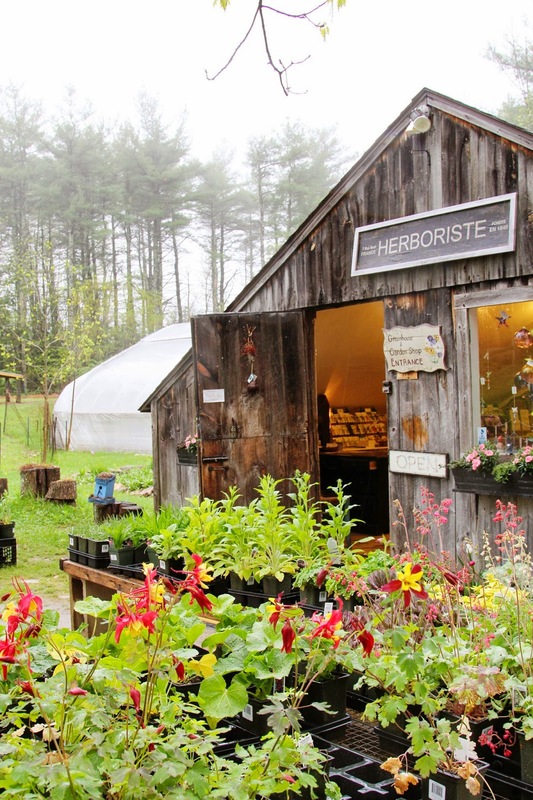 Join us at the herb store, I think you’ll find something here that you’ll love! FOR ONE WEEK ONLY — UNTIL SEPTEMBER 30TH — HERB STORE FAVORITES IS ONLY 99 CENTS! This Pumpkin Soup is a great fall soup, especially in the fall. We served this at one of our ‘Make and Take Luncheon’s’ one year. During those luncheons we had a craft such as soapmaking or papermaking and also served lunch so that customers could take a quick class on a lunch hour. The soup was ready and in a crock pot for a quick first course as we gave instructions for the class. This is from the Sage Cottage Herb Garden Cookbook. Add oil and onion to a 2-qt saucepan over median heat. Stir and cook until onion is translucent. Add remaining ingredients and cook over low heat for 15 minutes. Remove from heat, allow to cool slightly. Puree in a blender. Return to heat, adding a bit more tomato juice if the mixture seems too thick. Reheat without boiling. Garnish with toasted pumpkin seeds, if desired. Vintage Daze shares three sweet old time recipes- Marshmallow Delight, Aunt Melba’s Lemon Cake, and Pear Honey. Check out Vintage Daze for a dash of the past. I’m sitting here finishing up one of my all-time-favorite sandwiches, pear honey, like my Grandma used to make me. 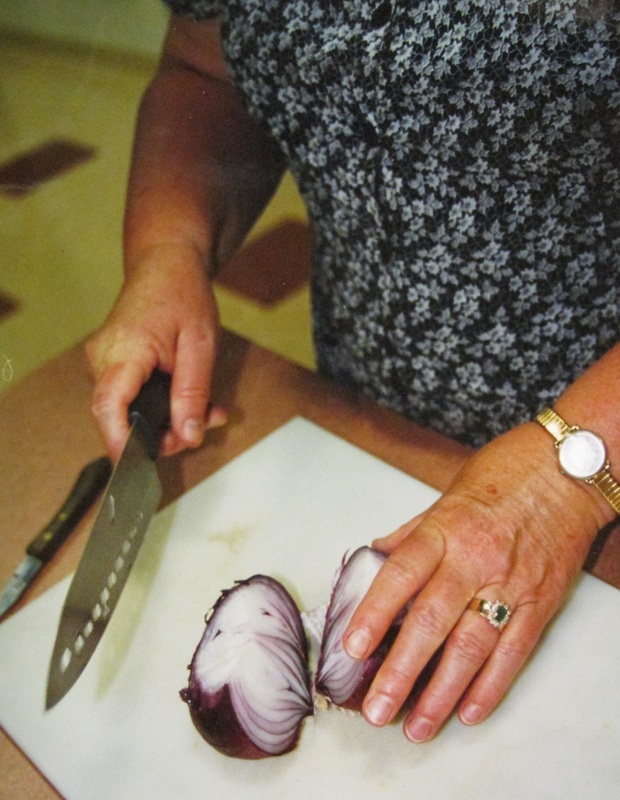 In her honor, this weeks’ Vintage Daze column shares a few of her recipes from the 1940’s. 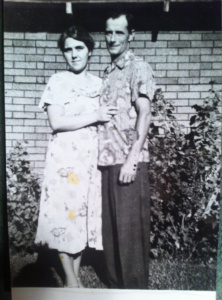 Here’s a few oldies, but goodies, compliments of grandma, Bea Jones. This recipe is handwritten in Grandma Jones’ cookbook. Most of the family, including Bea’s children and her grandchildren, remember this recipe fondly. Bea served this dessert for many years, including taking it to potlucks at the stone church in Glendora. The three Jones sisters, Iona, Helen and Ida, will vouch for how long this dessert has been around, since most likely one of the girls was in the kitchen making it. In A Second Chance, Jenny suffered a sudden cardiac arrest and is grappling with a flurry of thoughts and emotions about it. This scene takes place months later as she joins a friend for dinner. This week our prompt is ‘grim’. 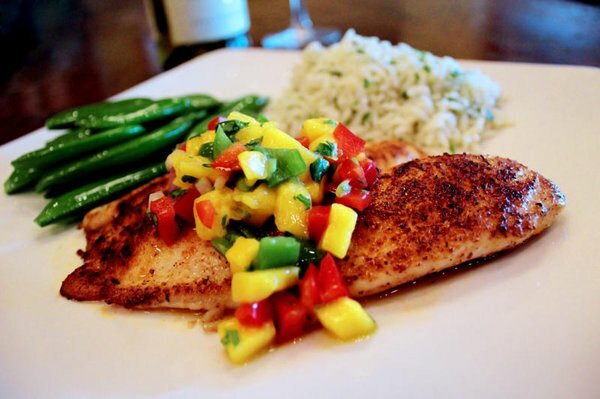 A steaming plate of fresh grilled tilapia covered in a mango sauce distracted me when it was placed before me. “All mine needs is a little sprig of fresh rosemary on the top.” I glanced over towards the dish being presented to my friend. “Those sizzling fajitas of yours look good too.” And those were the last words we spoke for a while as we each dove into our dinner. Carla groaned and laid her fork down. “I can’t eat another bite. I’m stuffed.” She pushed her plate towards the center of the table. “Oh, I almost forgot your book.” She rummaged around in the bag she’d carried in with her and pulled out a paperback that she handed to me. I barely heard her as I scanned the blurb on the back. “Pink Floyd,” I chimed in. The wheels in my head were already turning. I was thinking of this distancing that I’ve allowed in my life. 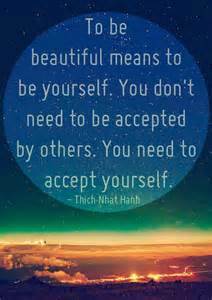 To live an authentic life and be true to myself, I must get to know myself – my true being – without the cloak of protection this gauzy layer provides me. So, what is my true being? What do I want to do with my life? “Why such a grim look?” Carla’s words interrupted my train of thought and brought me back to the two of us sitting in the restaurant. “Just thinking. You know, wondering who I really am and what’s important to me and where I want to go from here.” I chuckled and tipped my glass up for the last of its melted liquid comfort. As the weather begins changing and the days and nights begin cooling down, the abundance from the summer gardens also starts winding down to an end. Bell peppers should still be prolific…and perhaps you’re tired of your usual recipes. Here’s a tasty Red Bell Pepper Coulis, from Herb Store Favorites, that’s delicious served over some hot, fresh pasta. Chef Leslie Sassamon shared this recipe with our herb group when she was the featured guest, teaching us how to prepare several herbal dishes for our luncheon. This was delicious served over warm, freshly made pasta. 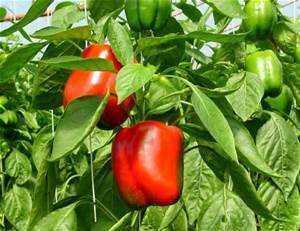 To roast red bell peppers, place directly over a gas flame on a cook top or under a broiler in the oven on high heat. Let skins of bell peppers blacken, turning to blacken the entire surface of the skin. Using tongs, place peppers in a bowl and cover with plastic wrap. Let peppers stand at least 10 minutes, as the heat from the peppers under the wrap will act to steam the skin from the fleshy part of the pepper. Pell the skin from the pepper. Remove seeds and membrane. Cut into 1” pieces. In a small sauté pan, sauté shallots and garlic in olive oil until soft. Reduce heat and add in white wine vinegar. Add in cream and continue to heat until cream is warm. In a blender or food processor, add in red bell peppers and mixture from the sauté pan. Pulse to combine and then puree until a sauce has formed. Season with salt and pepper to taste. Reheat sauce in saucepan over low heat. Serve warm over warmed cooked pasta. Herbs, herbs, herbs…Olde Thyme Gardens revolved around herbs – growing them, cooking with them and crafting with them. In Herb Store Favorites, we bring you the favorites that we collected. Cheese Dilly Bread, Cranberry Orange Honey Nut Muffins, Green Rice, Lavender Shortbread, Rosemary Cookies and Lemon Verbena Buttermilk Pound Cake – along with a host of others. 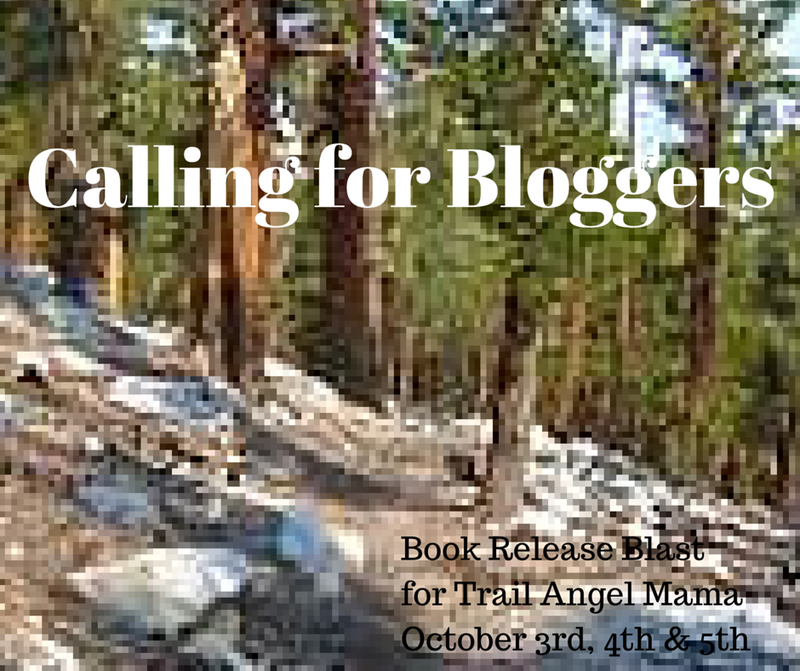 Trail Angel Mama – coming October 3rd! 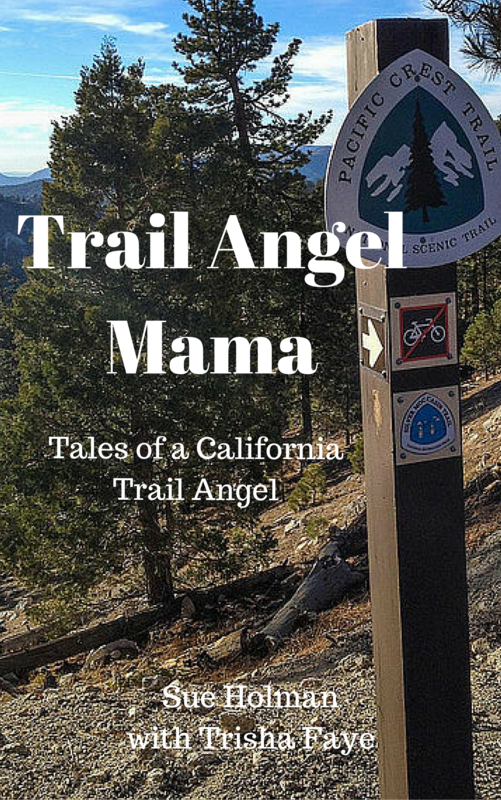 See the Pacific Crest Trail from the other side – from the viewpoint of ‘Trail Angel Mama’. Trail angels dispense trail magic to hikers; from a bottle of water or a ride into town, to a hot meal and a bed for the night. The Holman’s discovered a new world in this journey as hiker’s touched their hearts in an unexpected way. They set out to share blessings. Instead, they were the ones blessed. Here’s an excerpt from Trail Angel Mama. This is the first night that they hosted a large group of eight hikers. Will such a big group test the limits of their trail angel patience? Or will it confirm that they’ve made the right choice? Now I’m officially excited! It’s only been a week, and I got another trail angel call today. A hiker called ‘Burgundy’ called to see if we had room for him to sleep one night. “Of course,” I answered, happy to help out another hiker. “Ummm … Nine?” I was a little hesitant and I think he could hear it in my voice. 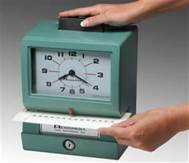 We arranged to meet at the post office in Wrightwood at 3:15, shortly after I got off work. I pulled up to a small crowd gathered at the post office, all accompanied by big – and by big I mean huge – backpacks. From the time I pulled up, they were the friendliest group. I didn’t know then that this is how the entire time would be, from now until they pulled out of the driveway the next morning. While we were all chatting in the post office parking lot, I saw a teacher from the high school. We said hi to each other. “Are you going hiking?” she asked me. A few of the guys picked up on this exchange and started joking about yes, I was joining them on the trail. When I saw her at work the next Monday, I told her that Mike and I are trail angels and explained what that meant. She said that she thought one of the hikers was my son because the group and I were on such familiar terms. But, back to the dilemma I was facing that Friday afternoon. I looked at my Jeep. I looked at the hikers. My head swiveled back to my vehicle. Then my gaze shifted to the mountainous stack of backpacks. I counted seats in my vehicle and tried to do some quick calculating, which is not my strong suit on a Friday afternoon after a long week at work, mind you. “I think we can do this in three trips,” I finally said. No. They insisted that I didn’t need to make so many trips. “Drive real slow and we’ll just run behind the car,” one of them suggested. After a brief discussion, one suggested that he could go with me and the backpacks and the rest of the group could walk to my house. …follow the blog for more snippets and updates on Trail Angel Mama as the Holman’s dispense trail magic in their small mountain town. In A Second Chance, Jenny suffered a sudden cardiac arrest and is grappling with a flurry of thoughts and emotions about it. This scene takes place several months later as she and three friends, two of them psychic, spent several weekends in a row trying to find the body of a murdered woman. This week our prompt is ‘steel’. The alarm rang much too early for a Sunday morning, my one guaranteed day off. “This is the third week in a row. Ugh, this is getting old,” I grumbled to myself. I hit snooze, thankful for another five minutes of slumber before that obnoxious ringtone would interrupt me again. Four snoozes later, I groaned and finally rolled over and sat up. I debated about skipping my morning shower. If this Sunday went anything like the past two, we’d all be filthy and sweaty by the end of the day. I headed towards the shower anyway. There’s something about wanting to be clean and fresh for a girls day out, knowing that at least two of the four of us would be dressed to impress, especially Nancy. I don’t care how casual the outing was, Nancy always looked like she’d stepped out of a fashion magazine. Carla, well she’d be in her typical tie-dyed t-shirt and jeans. Her attire never wavered. With Gail it was hard to tell. Sometimes she dressed in nondescript slacks topped with a nice ordinary blouse. When she was trying to prove how ‘psychic’ she was, she’d morph into Wanda the Fortuneteller, complete with crystals draped around her neck and bangles filling her arms. I opted for my own off-duty uniform. Blue jeans, of course and my favorite gray t-shirt with dragonflies flitting all over the front of it. When I opened the door and realized how chilly the morning air still was, I returned to the bedroom and added an open Levi shirt with rolled up sleeves. By the time I pulled into the parking lot where we all were meeting, I saw I was the last one there. The other three were standing around Nancy’s BMW chattering as if it had been years since we’d seen each other, instead of the single week that had passed. Her phrase caught my attention and I looked up to see if anyone had noticed it. ‘Talking to her friends’…hadn’t we all agreed that we weren’t going to mention our informal investigations to anyone else? Weren’t we going to keep quiet, until we found something concrete? No one else seemed to notice. All three were talking fast and furious, as if each were trying to monopolize the discussion. My head bobbed back and forth, listening to all of them, with an occasional nod or ‘Uh huh’. Which wasn’t anything out of the ordinary. I have a lot of thoughts and opinions, but when others dominate the conversation, I quiet down. This wasn’t a new occurrence with this group of friends. I’ve always been like that. The more animated the rest of the people get, the less I interject. Especially this early in the morning. I’d be perfectly happy if morning occurred, say, around noon. However, even when I’m still half asleep, that doesn’t mean I don’t realize when I get cut off in conversation, nor does it mean it doesn’t bother me. We’d been together for several hours as we first walked around a cove area at Lake Lewis, and then moved to the old barn. After repeatedly being talked over, my aggravation level was increasing from a slow simmer to a rolling boil. 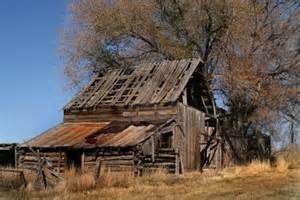 We sat in the old barn, eating sandwiches we’d picked up at the sandwich shop where we’d met. “I brought my pendulum. Let me see what I get with it.” After digging in her pants pocket unsuccessfully, Gail stood to retrieve her divination tool from her slacks. She turned her back on me and started pacing the length of the barn. Clamping down the rush of steam that threatened to explode from my ears, I rose and stomped out of the barn. I didn’t trust myself to open my mouth right then, or something ugly was bound to pop out of it. Standing in the bright sunlight I closed my eyes and basked in the warmth, away from the chattering magpies inside. I let the angriness subside and seep out of my limbs into the earth beneath me. Rustling footsteps behind us approached as the other two joined us in the neglected field surrounding the ramshackle barn. “The dramatic doesn’t bother me. It’s repeatedly being talked over and interrupted.” I spoke louder at the end of my sentence, making sure that the others could hear me as they got closer. “I can be loud too,” I protested. “Next week I’ll be the noisy one.” I spoke with steely regard. I was going to be too. Next week, I vowed, I’d talk up a storm and rule the group with my chatter. On the drive home I was already contemplating the hat I was going to make that week. Maybe even a t-shirt…I was going to proclaim my noisiness to the world, or at least to those at our next outing. I am not the noisy one. To think that I could suddenly transform myself into a talkative, boisterous woman taking control of the group and not letting them get a chance to talk is disregarding myself. 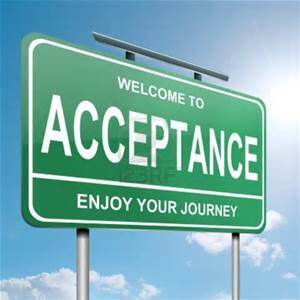 It means I am not accepting myself just the way I am. In A Second Chance, Jenny suffered a sudden cardiac arrest and is grappling with a flurry of thoughts and emotions about it. This scene happens after Jenny eludes a coworker’s invitation to lunch and she escapes to one of her favorite lunchtime locations…the local cemetery. This week we’re writing to a picture prompt. The scenes will be short, 300 words or less, so it will be quick reading. For more fascinating story snippets from the wonderful authors in the group, return to TUESDAY TALES here. Something about this old, historic cemetery called to me. With hardly more than a handful of headstones, and just as many large rocks signifying a burial, it sat next to a new housing development of towering McMansions, fenced in but otherwise ignored. I’ve loved visiting cemeteries for years, long before my cardiac arrest, so that’s not the reason. Cemeteries give me peace. Sitting there, trying to commune with lives past, is soothing to me. At one point in time, these people also walked this earth. They too lived and loved. They provided for a family, protected them, clothed them, they were a member of a community. Maybe. They could also have been a traveler, a man out to see the world, without a place to call home, following the wind and a dream. Now, what’s left to commemorate their life is a headstone with a time-worn name etched in granite or stone. Sometimes only a half-buried rock or pile of rocks marks a place where a body was once buried. 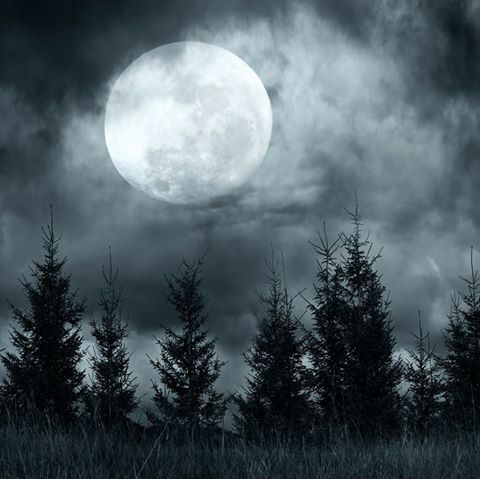 Many gravesites sprout trees or shrubs, sprouting from the place a body was once buried; a plant flourishing, taking nourishment from organic matter that the soul no longer requires. Many people are cremated and have been scattered to the winds, the sea or the earth. No tangible monument marks the site of their final burial. Fifty or a hundred years from now, no one will stumble across a headstone, rock or tree, marking the site of their last earthly presence. What memory of my life do I want to remain after I leave this cellular body? What do I want to leave to the future besides a name etched on a granite stone? A worthy answer eludes me. Come help us celebrate the release of TRAIL ANGEL MAMA on October 3rd. We’re looking for blogs for a guest post on one of three days, October 3rd, 4th, or 5th. Bloggers that participate will be entered into a drawing for a goody bag with lots of swag, including a $10 Amazon gift card. Bloggers will also be featured in a ‘Meet the Bloggers’ post and a ‘Thank You Bloggers’ post as we repay the favor by helping promote your blogs also. All guests that comment or share on the participating blogs during these three days will be entered into a separate drawing for their own goody bag of swag, also including a $10 Amazon gift card. Trail magic; kindnesses from the hearts of strangers add magic to hiker’s journeys. This magic is often small – a bottle of water, a ride into town, a candy bar. Sometimes the generosity is a meal or a bed for the night. The Holman’s, day hikers themselves, live near the Pacific Crest Trail. They searched for a way to give back to their community. When they gave another hiker a ride into town and he asked about a laundromat, it opened up a new journey for them. Opening their home for washing clothes, eating a hot meal, and offering a bed (or a couch) for the night gave them more than they ever expected. Their world expanded as they met hikers from across the nation, and from around the world. Hearts were warmed with the sharing of evenings tales and the hikers soon gave Sue her own trail name – Trail Angel Mama. Step inside and see the Pacific Crest Trail from the other side of hiking, as Trail Angel Mama tells her story of this new and exciting venture. The Holman’s discovered a new world in this journey as the hiker’s appreciation touched their hearts in an unexpected way. They set out to share their blessings with other hikers. Instead, they discovered that they were the ones being blessed.